Before crowdfunding, there was Drummond Pike. The 1970 politics graduate of Stevenson College was awarded the Social Sciences Distinguished Alumni Award for his accomplishments in combining philanthropy with political activism. Alumni, faculty, and university administration gathered at the newly renovated historic Cowell Ranch Hay Barn on April 29 to recognize his achievements. Pike founded the Tides Foundation in 1976 as a way to connect philanthropists with grassroots causes and public-interest groups. Pike was one of the first social entrepreneurs to pioneer the use of donor-advised funds. Instead of donating directly to a charity or starting a foundation, individuals can turn to a donor-advised fund to make charitable donations on their behalf. In the 1990s, Tides emerged as a key provider for the progressive community. Its low-cost, online donation services, Groundspring (now Network for Good), made it one of the nation’s largest sponsorship organizations. Tides has been a catalyst for hundreds of nonprofit organizations and projects launching. Pike also co-founded Working Assets (now called Credo) in 1985 and has helped business leaders including George Soros with their philanthropy. Soros has helped fund organizations like MoveOn.org and Human Rights Watch through Credo. In his remarks, Pike shared three lessons he learned at UC Santa Cruz: play by the rules, be transparent, and if it does not exist, go start it. Ask questions, invent, and innovate, he said. As a member of one of the earliest classes, Pike helped to shape the spirit that is UC Santa Cruz today. “There was no vehicle for student voices so we got to invent it,” he said about the intercollegiate board he established as a way to encourage more co-ed socializing in the dorms. He also helped found the first underground newspaper as a way to highlight issues impacting students. “His progressive values mirror our own,” said Chancellor George Blumenthal. 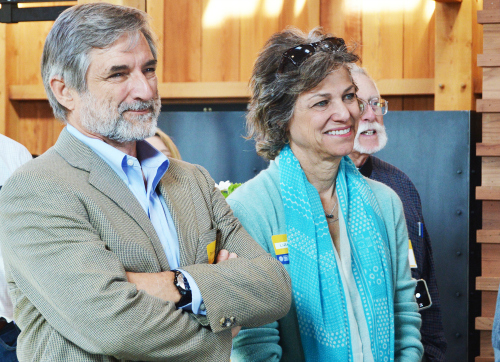 “Drummond deserves a Ph.D. in progressive social change,” commented Working Assets co-founder Michael Kieschnick in an email response to UCSC’s announcement of Pike’s award. “Pike is a model not just for students of the past but for students of today,” said Alice Yang, the provost for Stevenson College. Also offering remarks was professor emeritus of sociology Craig Reinarman who pointed out how the Tides foundation made it possible for donors to achieve more through its multiplier effect. The Social Sciences Distinguished Alumni Award is given annually to a social sciences graduate whose career is characterized by sustained and exemplary contributions to society through research, practice, education, policy, or service. Past recipients include Pulitzer Prize winner Dana Priest (’81, politics, Merrill) and NPR science correspondent Joe Palca (’82, psychology Ph.D.). The recipient is chosen by members of the Social Sciences Board of Councilors, an advisory board for the division.